Corrosion products, released from materials used in manufacturing of pipes and other parts of plumbing systems (e.g. heat exchangers), will always be present to some extent in tap water, as long as metals are used for these purposes (Linder and Taxen, 2002). This applies to all metallic materials irrespective of alloy. However, the extent of metal release may differ widely between different materials and for different water qualities and service conditions. In particular, the release of copper from copper pipes to the tap water has attracted considerable attention in recent years, not only due to the possible impact on human health of ingested copper with the drinking-water, but even more so (at least in Sweden) because of the rising concern when copper-containing sewage sludge is to be utilized as a soil conditioner in agriculture. A large number of studies have been published, where the influence of the water quality (inorganic as well as organic water composition), the water flow regime, the age of the pipes, etc., on copper release to tap water has been investigated (reviewed by Linder and Taxen, 2002). In older times, it was generally believed that elevated copper levels occurred in tap waters when the water was highly acidic, as was the case in many soft, untreated waters from private wells (Shull et al., 1960). However, in addition to this well-known influence of the pH-value, interest has later been turned also to the influence of inorganic carbon (carbonate) and natural organic matter (NOM) in the water. Obvious reasons for the interest in water alkalinity was, on one hand, the observation that higher copper contents were more often found in hard than in less hard waters and, on the other, that divalent copper may form soluble complexes with carbonate (see e.g. Mattsson, 1980). Quite often, carbonate was discussed as a single factor influencing copper release from plumbing materials. However, high carbonate levels in the water often occur together with a high calcium content. In such waters, the pH had to be kept comparatively low to avoid undesirable calcium carbonate precipitation. Thus, a high carbonate content in the water can often coincide with comparatively low pH values and, therefore, the observation of elevated copper in hard waters may - to some extent - be a pH effect and not only a result of high carbonate content (Linder and Taxen, 2002). In fact, an examination of the relationship between pH and carbonate content in the waters of 310 Swedish municipal water works has revealed that the highest concentrations of HCO3 (>200 mg/l) clearly coincided with pH-values in the range 7.3-7.4, while HCO3 concentrations <100 mg/l were the rule at pH-values >7.6. 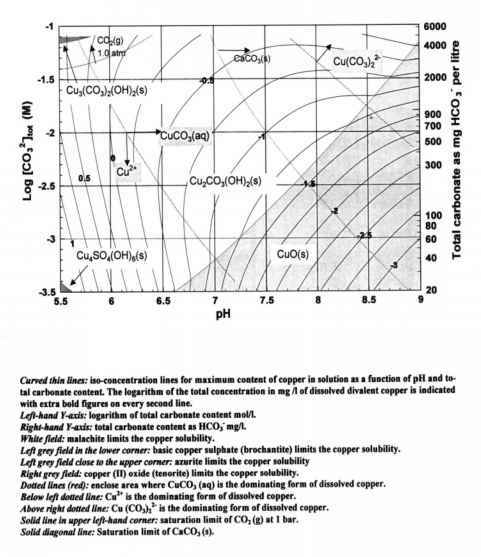 In the work by Linder and Taxen (2002), equilibrium calculations were carried out in order to examine the influence of various inorganic parameters on the copper solubility in a copper tube. These resulted in diagrams, which show the existing solids, the dominating dissolved cupric species and isoconcentration lines for dissolved divalent copper, including soluble complexes as functions of pH and content of inorganic carbon in the water. The diagram represented in Figure 4.1 shows the results when the thermodynamically stable solids copper(II)oxide, malachite, azurite and brochantite are present. Under these conditions, it was found that sulphate and chloride had no significant effect on the solubility of cupric copper. For the pH and alkalinity values usually encountered in Swedish drinking-waters, it is obvious that CuCO3 (aq) must be the predominant dissolved inorganic copper compound and CuO the main solid compound. The concentration of dissolved cupric ions is, in general, much lower than the measured total dissolved copper concentration (Sundberg, 2002). As will be further developed below, the deviation in concentrations of dissolved copper compounds from what can be predicted from the diagram in Figure 4.1, representing only inorganic copper species, is mainly attributed to NOM or colloidal effects. N.B. Red dotted lines are those two lines in the figure running from pH 7.2 to the upper left corner, and from 400 mg HCO3/l to the upper fifth quadrant, encompassing the solubility range where Cu2+ is the dominating form of dissolved Cu. • It has previously been assumed that Cu(OH)2 (s) - a precursor of CuO (s) - is the only solid that controls the copper solubility at all the pH values and all the carbonate concentrations found in tap waters. However, the results of the actual equilibrium calculations revealed that, in fact, it is less likely that the Cu(OH)2 model is generally valid for predicting the copper content in tap waters. • The presence of NOM in the water can increase the equilibrium concentration of copper and also affect the kinetics of attaining equilibrium with solid corrosion products. Complex formation between copper ions and NOM in the water cannot be neglected, but it is not likely to be the only cause of very high copper concentrations. • Copper may be adsorbed on substrates, both inorganic and organic, that have a colloidal nature. Tap waters contain various degrees of dispersed particles that may offer adsorption sites of both types. If copper is present in the water as dispersed small particles of corrosion products, this could explain some of the observed very high concentrations of copper. • More copper can be kept in the water if instead of complex formation, the main role of the organic substance is to disperse small, colloidal, particles of cupric copper compounds. • The copper release to drinking-water is not only a function of the water composition, but also of the flow in the pipes. • In many cases, the most efficient way to decrease high copper concentrations in a drinking-water is to increase the pH. For hard waters with high carbonate content, the pH-increase must involve softening. • It would be possible to find combinations of flow and stagnation periods, which are optimal for reaching an equilibrium condition with the lowest possible content of dissolved copper in a drinking-water. 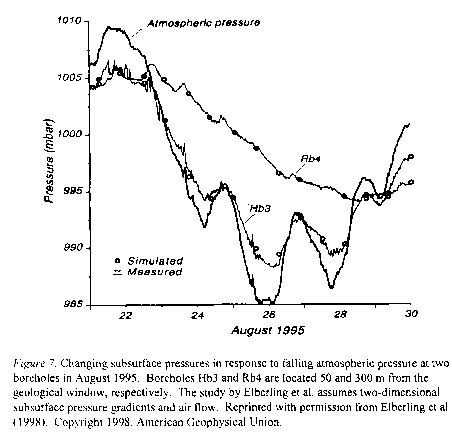 However, the optimal conditions may be somewhat different for waters with different composition. With the above equilibrium calculations in mind, Sundberg (2002) examined the copper speciation in the drinking-water of the city of Uppsala, Sweden, where high to very high copper concentrations have repeatedly been recorded. The water composition after >12 h stagnation in a cold water copper pipe, more than 30 years old, was analysed once a year for 5 years. Some of the variables showed greater variation than the others; e.g. pH varied in the range 7.2-7.7, alkalinity between 225 and 326 mg/l and total copper in the range 1.5-2.4 mg/l (after flushing the pipe, the total copper was 0.5 mg/l). Free cupric ions in solution were measured by means of an ion specific electrode, and were found to vary between 0.05 and 0.25 mg/l (311% of the total copper content). In an attempt to explain the great discrepancy between the concentrations of cupric ions and total copper in the drinking-water, Sundberg (2002) relied upon a few analyses of DOC in the water, which varied between 4.4 and 16 mg/l, and concluded that most of the copper released from the copper pipe was complex bound to the organic material. Based on the observation that the increase in total copper in the water after flushing was rapid; i.e. from 0.5 mg/l to about 2.5 mg/l in 5 h, Sundberg further speculates that the corrosivity of the water brings about a rapid copper release, but that the released copper is almost immediately bound to the DOC (since almost no carbonate scale is formed on the inner surface of the pipe) and that the corrosion process will go on until an equilibrium is reached between dissolved copper and DOC-complexed copper. When water is drawn and fresh water enters the tube, the whole process starts again. The predominant role of organic ligands for keeping copper released from tap water pipes in solution is further corroborated by a German study, which showed that TOC-values of >2 mg/l in most cases would give total copper levels of 1-4 mg/l after 4 h stagnation in copper pipes (Priggemeyer et al., 2001). It was estimated that some 90% of the total copper in this water was bound to organic matter (Sundberg, 2002).